Product Type: Brodit Passive Car Cradle Holder With Tilt Swivel Function. 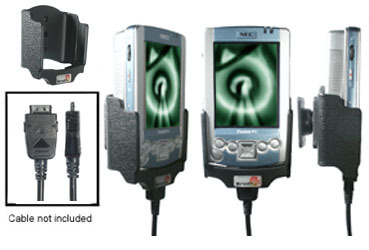 Fitment: Nec 300E MobilPro For All Countries. With your PDA in a passive holder attached onto the dashboard it is always within easy reach -safe and convenient. The holder is mounted onto a tilt swivel so it is adhustable for avoiding light reflection on the screen. It is easy to put the PDA in the holder, and to take it out of the holder. You can connect e.g. a charging cable to the PDA when it is in the holder.